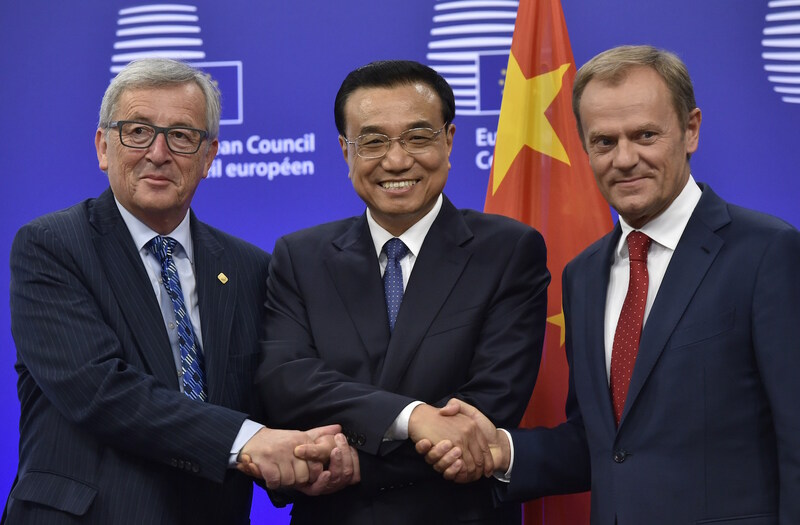 European Commission President Jean-Claude Juncker (left), China’s Prime Minister Li Keqiang (center), and European Council President Donald Tusk (right) shake hands following their meeting at the E.U. headquarters in Brussels on June 29, 2015. Economic relations between Europe and China remain highly salient due to the potential for increased trade and investment, as well as future cooperation on projects stemming from the Belt and Road initiative. Yet, in this podcast with Paul Haenle, François Godement argues that China-E.U. commercial relations are increasingly asymmetric and spontaneous, which presents opportunities and challenges to the overall relationship. Godement is skeptical that the growing presence of Chinese state-owned enterprises in the E.U. is part of a planned Chinese government strategy. As China’s economic slowdown causes Europe to lose confidence, Godement argues that the dynamism of China’s new economy reflects an underlying resilience, while managing emerging sectors will present a new challenge for Chinese policymakers. Underlying all of this, Godement discusses how the Belt and Road initiative reflects the complexity of China’s relations with the United States, Central Asia, and Europe.